People are beginning to return to their homes if they still have them, and the long cleaning process is starting. Much of what remains is toxic and will have to be removed by CalFire. Rain is expected later this week and the fires may be out by Friday. I used to love the smell of woodsmoke, but now it horrifies me. People always think earthquakes are the dangerous thing about living in California, but it’s really wildfires. My friends in Redwood Valley all survived, though one lost her house and everything in it. They are beginning the lengthy clean up and recovery process. The one person I know who lived in Santa Rosa until last month would have been evacuated. He and his family are in Anaheim for a year, since he is working on a project for Disney. And they were evacuated in the Anaheim fires. They are all OK, though. After such a terrible week, it seemed like a good time to do some celebrating. And what better way to start than a party for a cat at a bookstore? 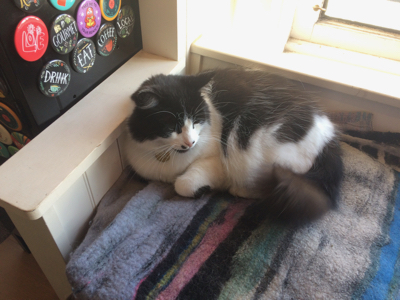 And perhaps being the guest of honor had a good effect on his usual grumpiness, since he tolerated the attention and mingled with his guests, waving his tail and accepting pets and compliments. I won some notecards and Megan won a cat sticker. 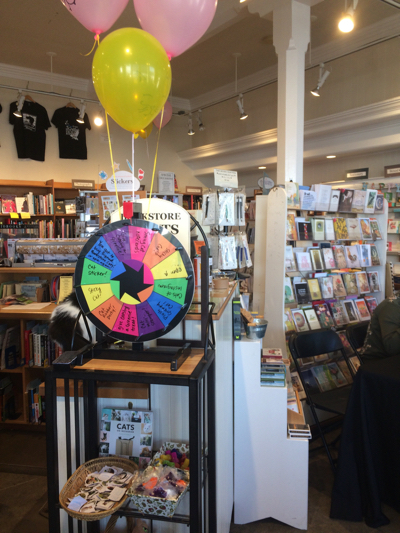 Someone had already won the grand prize of feeding Catsby a can of tuna by the time we got there (as you can see to the left of the wheel), but we could still color in Catsby ears to wear on our heads, decorate cupcakes, and buy books. After the party, we stopped by a local inn for a drink. We parked next to a beautiful, shiny, vintage black El Camino, and I mentioned to Megan how much I love those cars, despite their lack of practicality. I will almost always choose form over function. We also noticed that the lights were on, so we notified the hostess and she started asking the bar’s patrons if the car was there. A well-dressed gentleman sitting next to us turned out to be the owner, and he ran out to turn off the lights and then toasted us with his martini on his return. 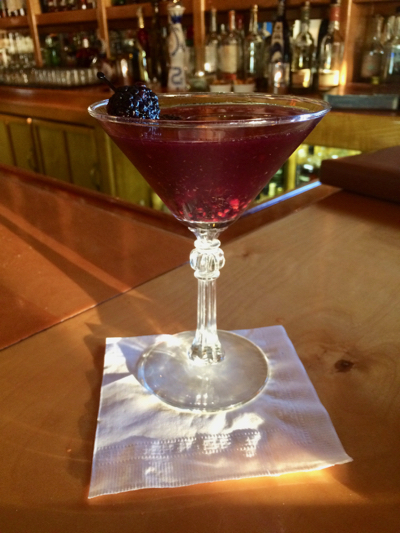 They were made of vodka, fresh blackberries, lemon juice, and Chambord, garnished with three fresh blackberries. It was a nice end to a crazy week. You can imagine how busy Megan was at work this past week with the fires, and she worked an extra shift. The next day, I went to a friend’s 70th birthday party on the beach at Big River. Big River is just south of the Village and the beach is where the river empties into the ocean. Big River’s name refers to the size of the redwoods that grow on its shores rather than the river itself. And yes, there is a Little River, the next town south of Mendocino. There the soil is acidic and hard, as it is at our house, and there the redwoods are much smaller, hence Little River and the Pygmy Forest. I expected it to be cold and windy, but was pleasantly surprised to find it warm and sunny. Some of the kids were even swimming in the river! There were lots of people and lots of food, and it was nice to be together and celebrate after this dark week. A YEAR AGO: Storms and Halloween décor, at work and at home. ‘Tis the season. FIVE YEARS AGO: Lots of unexpected gifts. Finally some relief for your part of the country. Always nice to have life return to its normal after such tragic moments. It does not change what has happened but gives people hope for renew and the future. there’s also nothing wrong with a little celebration and spending time with friends and family, Even the Great Catsby seems relieved.